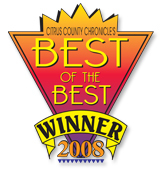 Three Time 2008 Best of the Best Award Winner: SanderSon Bay Fine Homes. Best Home Builder, Best Remodeler and Best Contractor. Chuck Sanders and the staff of SanderSon Bay Fine Homes are ready to serve you and your family with your custom home needs in Citrus County as well as any remodeling ideas you may have for your existing home. "The great part about the Best of the Best awards are that they are voted for by members of the community. So I just want to say, Thank You to everyone who voted for SanderSon Bay Fine Homes."